Interest in bergamot's ability to protect neurons from excitotoxicity has encouraged an ongoing surge in neuroscience research. If you’ve even enjoyed a mug of Earl Grey Tea, you have this essential oil to thank for the pungent punch of citrus which you enjoyed. It’s derived from the sweet, citrus taste of the bergamot, (Citrus bergamia). 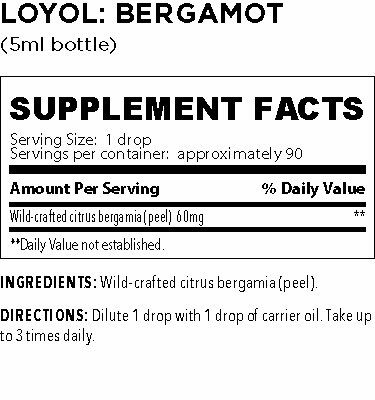 Most aren’t aware that bergamot is a member of the citrus family. We have chosen to offer Bergamot essential oil, harvested from the mountainous regions in Italy, we strictly use the peel of the citrus fruit due to its support of the digestive system and the flow of communication in the brain. While it’s unusual for a tree to blossom in the winter, we suspect that it’s no coincidence that the Bergamot trees do so, yielding a pleasant symbolic reminder of its uplifting nature that it delivers even amidst the darker, more dreary seasons of the year. If you’ve ever inhaled the heady aroma of a citrus orchard then you know it has an uplifting effect—just what Moms have long recommended for a mental “pick-me-up”. So think of Bergamot is your ideal friend to take to work or family gatherings as it can have a dramatic effect on a stressful task or a day jam-packed with time-sensitive errands. Even anxious anticipation can’t deny the impact of this heady scent. With the power to take back control of your mind and support your digestive system, Bergamot is a significant value in a world that would otherwise embrace therapy couches, and pink chalky drinks. With Bergamot essential oil you can now affordably feel relaxed and settled in both the mind and the digestive system. Enjoy it in some sweetened whipped cream for a light refreshing dessert or an uplifting cup of tea! Analgesics: In animals, intraplantar injection of bergamot essential oil dose-dependently inhibited the acute nociceptive behavioral response (i.e., licking and biting) to injected capsaicin (24). Moreover, the injection of linalool and linalyl acetate, volatile components of bergamot essential oil, demonstrated an even stronger antinociceptive behavioral response than bergamot oil alone. Antianxiety agents: In healthy humans, bergamot oil has been shown to lower stress when administered as a combination aromatherapy (83) and increase perceived ratings of calmness and relaxation when administered topically in combination with lavender (66). Antibacterials: In vitro and in food systems research, bergamot oil has been shown to be active against Arcobacter butzleri (26;25;9). When administered in combination with orange essential oil, bergamot inhibited the growth of vancomycin-resistant and vancomycin-sensitive strains of Enterococcus faecium and Enterococcus faecalis (29). The effects of bergamot with antibiotics are not well understood. Antifungals: In vitro and in food systems research, bergamot oil has been shown to be active against Candida spp. (28). The effects of bergamot with antifungals are not well understood. Anti-inflammatory: The coumarins found in bergapten might be used for such medicinal purposes as inhibiting lipid peroxidation, generating neutrophil-dependent anion superoxides, and suppressing the activity of both interleukin-8 (IL-8) and COX-2, important anti-inflammatory and immunosuppressor activities (30;31;37;32). The effects of bergamot with anti-inflammatory agents are not well understood. 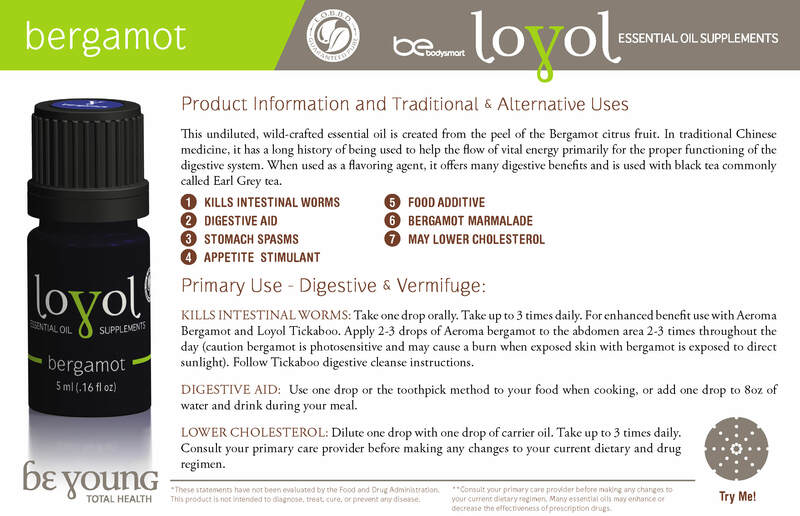 Antilipemics: In animals and humans, oral bergamot extract increased high-density lipoprotein (HDL) cholesterol, inhibited HMG-CoA reductase activity, and decreased levels of triglycerides, total cholesterol, and low-density lipoprotein (LDL) cholesterol (42). Antineoplastics: In human SH-SY5Y neuroblastoma cells in vitro, bergamot essential oil was shown to concentration-dependently inhibit Akt-mediated cellular proliferation (84). Antioxidants: In animals, bergamot antioxidants may prevent neointima proliferation and thereby help heal vascular disorders (85). In in vitro research, bergamot essential oil prevented the accumulation of reactive oxygen species and the activation of calpain, GSK-3beta, and TNF-alpha (13;31). In animals, bergamot together with boxthorn, was found to increase the activity of superoxide dismutase and the amount of collagen, and decrease the amount of malondialdehyde in the skin of mice (41;5;10). Cardiovascular agents: In animals, bergamot antioxidants may prevent neointima proliferation (85). In healthy humans, a topical blend of bergamot and lavender essential oils decreased both pulse and blood pressure (66). Hypoglycemics: In animals and humans, oral bergamot extract lowered blood glucose (42). Hypotensives: In healthy humans, a topical blend of bergamot and lavender essential oils decreased blood pressure (66). Immunosuppressants: The coumarins found in bergapten might be used for such medicinal purposes as inhibiting lipid peroxidation and generating neutrophil-dependent anion superoxides, important anti-inflammatory and immunosuppressor activities (30). The effects of bergamot with immunosuppressants are not well understood. Photosensitizers: In humans, animals and in vitro, bergamot oil has been found to be phototoxic and capable of producing erythema and Berloque dermatitis (52;53;54;45;46;4;10;47;55;7;56;57;58;59;60;61;62;8).